Circle mandala designs can have many different meanings and multiple circles within mandala designs add a whole new list of symbolic meanings. The circle is at the heart of mandalas. However, the mandala could basically be a circle with a heart at the center, which would give it an altogether different meaning. Circle patterns in mandalas draw the viewer in so that they perceive themselves within the mandala. This is a natural reaction to circles anywhere that all people experience. 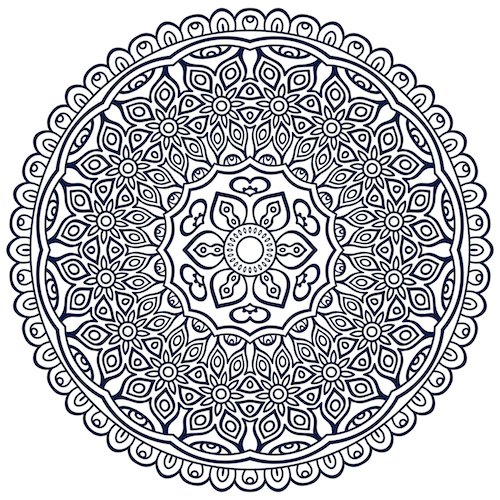 In fact, that is a part of the mandala concept – to draw you in and/or encourage you to include yourself or think of yourself within the mandala design. Dr. Jung was a Swiss psychiatrist who was a firm believer in the therapeutic benefits of mandalas. It is because of him that mandalas and mandala coloring have become so popular. Circles symbolize oneness, wholeness, inclusion and unity. Nurturing, mothering and the womb are symbolized with circles. Circles can also be used in mandala to indicate a new beginning, initiation or completion. Bull’s eye mandala designs, which have circles within circles, symbolize focus and concentration. They naturally pull your attention into the circles. This type of mandala can help you focus during meditation or help you train yourself to be more focused and develop better concentration. The five-fold Celtic symbol, which is four circles joined at the center with a fifth circle, has a number of symbolic meanings. It can symbolize directions – east, west, north, south and center. It can also symbolize the elements – air, fire, water, earth and aether. It can also represent the four seasons with the fifth circle representing transit. There are a number of other meanings that can be applied to the five circles. Circle mandala art is readily available in nearly any color, combination of colors and media that you could imagine. There is a nearly unlimited number of patterns. This form of art is extremely flexible and lends itself well to artistic expression. You will certainly be able to find a print, painting, drawing or banner that will complement your décor. It is even used in sculpture, collage and fiber arts. Etsy has a wonderful selection of circle mandala art. Circle mandala patterns lend themselves well to jewelry, too, especially pendants and earrings. As with art, the jewelry can be nearly any color or media that can be made into jewelry. There are circle mandala earrings and pendants made with string, from metal and with gemstones or beads. Silver filigree makes lovely, delicate circle mandala pendants and earrings. You can easily find jewelry made with circle mandala patterns to suit your taste and match any outfit. Etsy has a great selection of mandala jewelry. Coloring circle mandalas is extremely therapeutic, relaxing and just plain fun. You can easily create your own circle mandala coloring pages with a pencil and compass. That is the best way to color mandalas because it gives you complete freedom to create any design you like. Make circles of various sizes, circles within circles and circles joining circles. Any coloring media can be used. Colored pencils are best for intricate designs because they can be sharpened to a fine point. Water color or oil-based paints can be used to color in mandalas. Pastels can be used if you prefer softer colors. Crayons can be used to color mandalas. Charcoal works great if you prefer to color your circle mandalas in shades of grey and black. You use whatever you prefer. The goal is self-expression, relaxation and enjoyment. 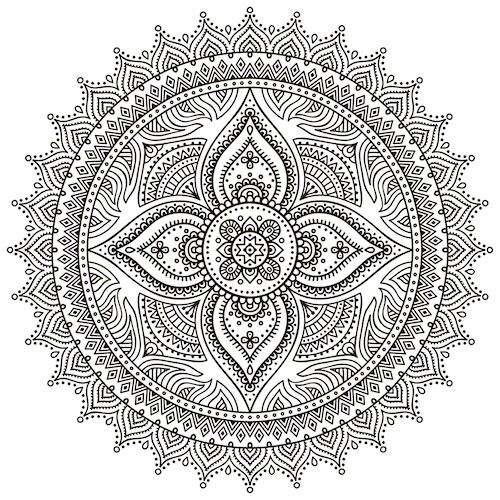 Circle mandala coloring pages are available online for free. Coloring Castle has hearts and circles mandala coloring pages and some other fun mandala designs that you may enjoy. You can buy circle mandala coloring books, too. There are mandala coloring books on Amazon for around $5. Circle mandala patterns make wonderful tattoos. They can be as simplistic or complicated and colorful or muted as you like. You can have a circle mandala design that incorporates another symbol to change the look and meaning. For example, the tattoo can have a circular edge with the lotus flower within the outer circle. The lotus represents life, renewal, creation and balance. When placed within the circle, this tattoo could be a powerful symbol of new beginnings, renewal and a forward transition in life. A circle mandala tattoo with a heart at the center would symbolize new love or everlasting love. The tattoo can be done in shades of grey and black or it can be more colorful, if you like. In general, mandala tattoos should be placed on a large, flat part of your body. Circle mandala tattoos look best and are much easier to admire when the viewer can see the whole thing all at once. Wrapping them around a leg or arm detracts from the visual impact. Scaled down circle mandala tattoos, however, can look good on an arm or leg.